We are developing the “push-pull” test as a field technology for providing model input parameters used to describe microbial transformations and sorption of chlorinated aliphatic hydrocarbons (CAHs) with emphasis on trichloroethene (TCE). Twoe types of push-pull tests are currently being used at TCE-contaminated field sites: (1) Anaerobic transformation potential is being quantified by measuring in situ transformation rates for a suite of injected surrogate compounds (including trichlorofluoroethene), to probe for the presence of organisms with the metabolic capability to anaerobically transform TCE to less chlorinated products. The assay characterizes both the extent and rate of reductive dechlorination of TCE to cis-DCE, trans-DCE, vinyl chloride, and ethylene. (2) Sorption is being quantified by conducting transport tests (with microbial activity inhibited) to determine sediment:water distribution coefficients (Kds) for TCE, its transformation products, and co-contaminants (if present). Anaerobic Transformation Potential – This assay is designed to provide quantitative information on the presence and activity of microorganisms with the specific metabolic capability to anaerobically transform TCE to less chlorinated products. To do this we will develop a push-pull assay based on injecting the fluorinated surrogate of TCE, trichlorofluroethene (TCFE). Recent research in our laboratory indicates that TCFE follows the same reductive dechlorination pathway as that of TCE (Fig. 1). Furthermore, we have completed a set of field experiments conducted at a TCE-contaminated field site that unequivocally demonstrate that injected TCFE undergoes reductive dechlorination under in situ aquifer conditions and follows the same pathway as that of TCE (Fig. 4). Based upon these results, we hypothesize that TCFE transformation can be used as a diagnostic tool for detecting microorganisms possessing the capability to transform TCE. For this project we will explore a variety of approaches for increasing the sensitivity and selectivity of this assay. 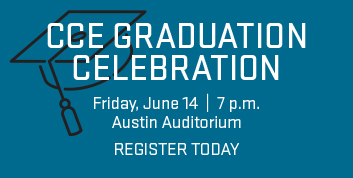 For example, we will explore the sequential injection of TCFE, cis-DCFE, and CFE to probe for individual steps in the reductive dechlorination pathway. We will also explore the possibility of injected 13C labeled surrogate compounds in an attempt to design a single test that can separately detect and quantify rates of each dechlorination reaction. The ability to discriminate between injected TCFE and its transformation products from high background concentrations of TCE by gas chromatography/mass spectrometry makes this assay particularly useful for application at candidate MNA sites. Note that TCFE is not regulated and we have received regulatory approval to inject TCFE at a site in California. Sorption – This assay is designed to provide in situ values for sediment:water distribution coefficients (Kds) for TCE and its anaerobic transformation products. These data are needed as inputs to numerical modeling of site-scale contaminant fate and transport. We have recently published a technique for conducting short-duration (~hrs) push-pull tests to determine retardation factors (Rs) and Kds for organic contaminants present in site groundwater. The approach consists of injecting contaminant-free water containing a nonreactive tracer (e.g., Br-) and then extracting the test solution/groundwater mixture from the same well. During the extraction phase, samples are collected and analyzed for tracer and contaminants of interest to develop a suite of breakthrough curves, one for each compound. Retardation of sorbing compounds results in increased dispersion of the contaminant breakthrough curves relative to the breakthrough curve for the nonreactive tracer (Fig. 5). An example of the application of this approach to determine Rs for toluene at a BTEX-contaminated site is shown in Fig. 6. Using this approach it should theoretically be possible to determine Rs and Kds for an entire suite of contaminants present in site groundwater by performing a single push-pull test in an existing monitoring well. For this project we will evaluate the practicality of such an approach and will develop numerical methods for rapidly interpreting test data. Our goal will be to develop a simple spreadsheet macro for this purpose. For this approach to be successful it will be necessary to insure that injected test solution geochemistry (alkalinity, pH, etc) is matched to that of site groundwater (so that Kd values are representative of in situ conditions) and that no transformation reactions occur during the test. To address the latter issue it may be sufficient to conduct tests quickly (~hrs) but we will also explore the use of microbial inhibitors including dissolved acetylene gas. Figure 3. 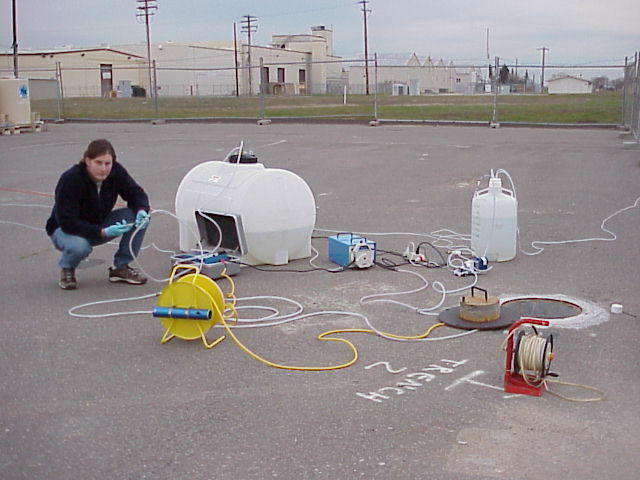 Typical field setup used in push-pull tests. Figure 4. In situ transformations of coinjected TCE (left) and the fluorinated surrogate TCFE (right) under anaerobic conditions in a TCE-contaminated aquifer. Figure 5. Type-curves used to interpret push-pull transport tests to obtain values for contaminant retardation factors (R) and sediment:water distribution coefficients. Contaminant concentrations increase to background values (relative concentration = 1) as extraction pumping continues. Vext is the volume of water extracted at the time a sample is collected; Vinj is the volume of injected test solution. Note that the test solution contains no contaminants.